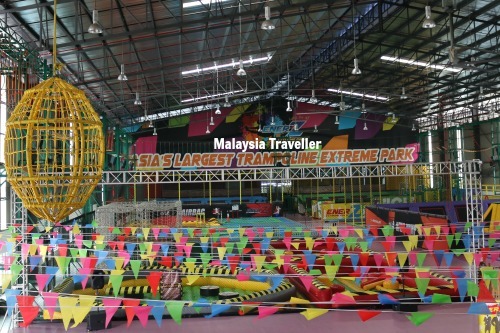 EnerZ Indoor Extreme Park in Subang Jaya claims to be Asia’s largest trampoline extreme park with over 80,000 square feet of space. 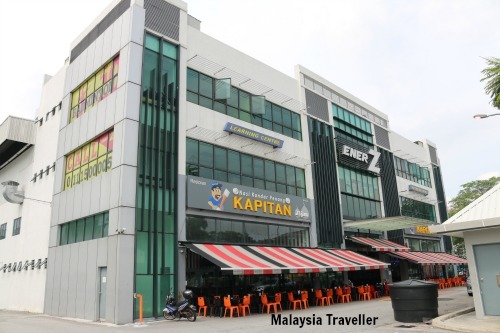 It certainly looks big, filling a vast industrial warehouse building with a Nasi Kandar Penang restaurant at the front (not part of Enerz), the Extreme trampoline park in the middle and 12 badminton courts at the rear, plus event rooms and meeting rooms for parties and team building programs. Trampolines are the main event and are popular not just with kids and young people but with anyone looking to maintain fitness and to enjoy a fun workout. Tramrobics classes are held to incorporate a full body workout that can burn up to 1,000 calories per hour. The trampoline areas are equipped with air bags, foam pit, bouncy walls, basketball nets, a gladiator fighting pit and a Wipeout-style section. Dodge ball is another popular team activity. 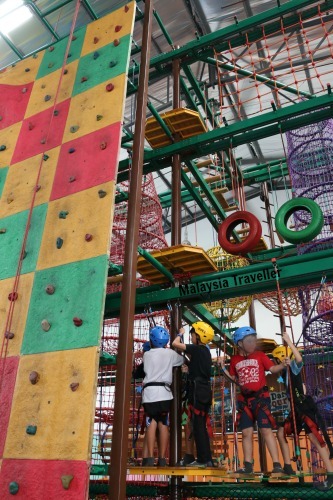 This is a 3 story obstacle course with 58 games, enough to entertain and challenge even the most energetic of children. One of the friendly staff. 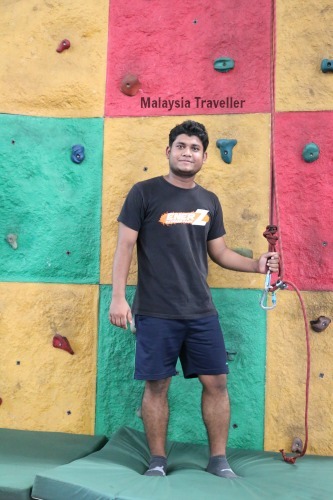 A rock climbing wall is a good place to practice under the supervision of trained staff. All around the walls of the Extreme Park, suspended 7 metres above the ground, is an obstacle course with swinging ropes, ladders and so on for more adventurous visitors. It looks scary but with safety harnesses and the supervision of trained staff, you have a safe environment. 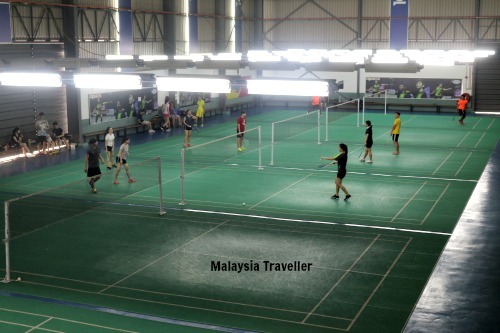 Twelve rubberised badminton courts are available at the rear of the Extreme Park. Separate charges apply. Just add RM 10 for return ticket (Off Peak) or RM 13 (Peak). 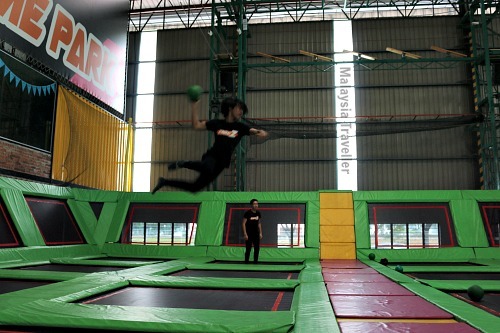 Dodge Ball 1 Hour (max 24 players) Off Peak RM 120, Peak RM 150. 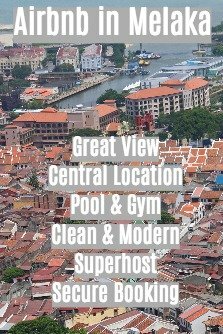 Check their official website to keep up to date with changes to pricing and programs and to book online. The park is not suitable for children below 90cm. Anyone below 140cm must be accompanied by an adult. Monday - Friday 2 pm to 10 pm. View of EnerZ Indoor Extreme Park from the front.